This is perhaps the most worldwide known work performed during my professional life, as proved by my 124 papers or lectures and the 233 press articles on the subject. It began in 1972, soon after I had joined Cselt (Center of Studies & Laboratories of Telecommunications) in Turin, Italy. My previous job was with GT&E Italy in Milan, where I had worked for about 20 years as a researcher in the fields of microwave (terrestrial and satellite) telecommunications and related measuring equipment. My work on optical communications ended in 1989 when I retired, and therefore lasted about seventeen years. When I came to Turin, in 1972, I was struck by the peculiar atmosphere of this city: people seemed not to care of the time needed to do things: their general mood was “do it well”, contrary to other cities of the industrial regions of Italy, where the dictate was “do it quickly”. I thought that this had probably originated from the habits of the “Suppliers of the Royal House” at the time when Turin was the capital of Italy under the Kingdom of Savoy. I was so impressed, seeing a car technician adjusting the doors of a Lancia until they closed with a soft touch of a finger, or a seamstress adjusting a fashion dress until it perfectly fitted the body of a lady, or a chocolate maker repeatedly refining his chocolate cream until it was quite impalpable, that I literally fell in love with Turin, as the most longed for place to do advanced research. In fact, Turin had been the cradle of scientific and technological advancements in the fields of radio, television, computing, medicine, astronomy, car styling, fashion, as well as one of the most industrial cities of Italy. To let you understand how my work on optical communication started, I must recall that, after the pioneering paper by Kao and Hockham of 19661, it was Corning Glass Works—a non-telecommunications company, widely known for its Pyrex® pottery—who, in 1970, succeeded in manufacturing optical fibers with low enough attenuation (< 20 dB/km) to be used for telecommunications2. The Corning’s fibermaking process was protected by patents and, in order to conquer the major part of the then emerging market, they managed to sign timely contracts with the major cable manufacturers of the world. Contracts were signed with Western Electric Cable Works in the United States, Furukawa Electric in Japan, Standard Telephones & Cables (STC) in the United Kingdom, Siemens A.G. in Germany, Câbles de Lion in France, and Industrie Pirelli in Italy. Cselt acted as an intermediary between Corning and Pirelli, since the head of our Laser Department, Leonardo Michetti, had met his colleagues at Corning in various conferences. Cselt entered into the contract with Corning and Pirelli with the task of studying applications of optical fibers in actual telecommunications networks. This contract was signed on October 15, 1973. By favorable coincidence, Cselt had already gained experience in the field of optical communications, though limited to laser transmission through the atmosphere. In fact, since 1965, Cselt had successfully established a He-Ne laser link between its premises in Turin and Mount Maddalena, over a distance of 6.6 km (Fig. 1). On this link, 12 PCM telephone channels had been transmitted in 1965 and 24 PCM telephone channels in 19673. As known, however, optical communications through the atmosphere was impracticable in bad weather and therefore the possibility of using instead optical fibers as a transmission medium was very welcomed. Moreover, Cselt could boost a remarkable know-how and experience in about all fields of telecommunications, i.e., in addition to transmission (by either radio or physical carriers), in switching, coding, end-user terminals, CAD, and solid state technology. Fig. 1. 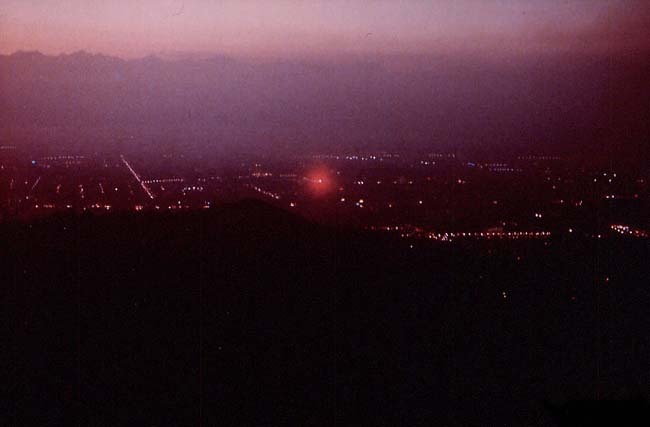 Spot of the laser beam emitted at Cselt, as seen from Mount Maddalena (1965). The collaboration between Cselt and Corning was very fruitful, since Cselt engaged in a thorough system study early enough to allow Corning to optimize their fiber design. I personally made that study, in collaboration with Dr. Luigi Sacchi of Cselt and presented it (in Italian) at the IIC conference in Genoa of 1975, where it was awarded as “the best scientific paper" of the conference4. From the conclusions of this study, Corning designed a new graded index fiber that they informally named "Catania's fiber" to acknowledge my contribution. Another valuable Cselt contribution to the contract was the environmental testing of the first optical cable constructed by Pirelli with Corning fibers, that was named COS 1. The acronym COS means "Experimental Optical Cable" ("Cavo Ottico Sperimentale" in Italian). The optical cable used in the COS 1 experiment was laid down by Sirti, a subsidiary of the Cselt holding company, STET (now Telecom Italia), in March 1976, with the same techniques as used in intercity routes. It was equipped with four multimode, step-index fibers and two graded index fibers, exhibiting attenuations ranging from 4 to 9 dB/km. It was 984 m long and was laid down in three turns in an approx. 150 m long trench , dug in the lawn of the Cselt premises (Fig. 2). Fig. 2. 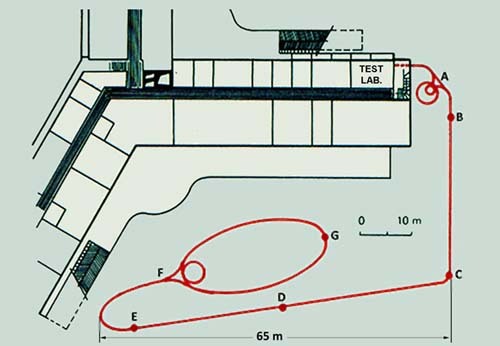 Layout of COS 1 optical cable within the Cselt premises. The experiments conducted by Cselt on the COS 1 cable mainly consisted in the measurement, at certain time intervals, of attenuation, dispersion and crosstalk of the various optical fibers contained in the cable, and in the investigation of their correlation with the environmental conditions, such as temperature, humidity and vibrations, as measured by suitable sensors. Radioactivity of the soil in the trench was also measured, before the cable laying. We presented the results of the first 6-months trials in a paper at the 2nd ECOC (European Conference on Optical Communications) in Paris, 27-30 September 19765. 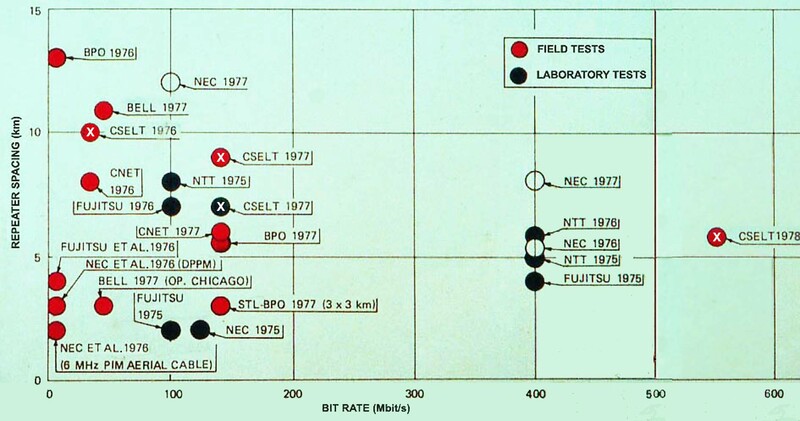 The results of these tests (which continued for another year, up to the end of 1977) were very encouraging and, therefore, a second field experiment, called COS 2, was planned at once, to test a second optical cable in urban areas, aimed to operate in actual service with PCM telephony. A third experiment, named COS3/FOSTER, was made a few years later in the urban area of Rome, over a 16-km route of ASST, a Government-owned telephone company, operating in the long-distance network. An overview of these three experiments is reported in an invited paper at the International Conference on Communications (ICC ‘80) in Seattle, WA, June 1980 6. Fig. 3. 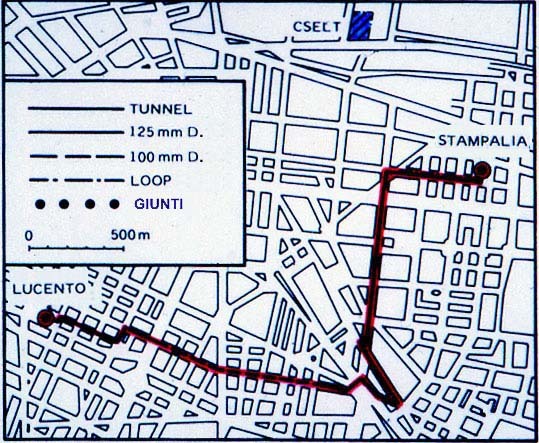 Layout of COS 2 optical cable between the Stampalia and Lucento telephone exchanges in Turin. The laying of the COS 2 cable, mostly done through the urban ducts of the Italian Telephone Company SIP, also of the STET Group (now Telecom Italia), was completed on 15 September 1976, thus representing the first optical cable in urban areas of the world. The main cable, equipped with 3 graded-index fibers, supplied by Corning Glass Works, was manufactured by Pirelli and laid down by Sirti, with proprietary processes. It connected the Stampalia and Lucento exchanges of SIP over a distance of four kilometers (Fig. 3). An extra loop-cable, 1 kilometer-long, also made by Pirelli and laid down by Sirti, was equipped with seven fibers, four supplied by Corning and three made by Cselt with MCVD (Modified Chemical Vapor Deposition) technique. By putting the various fiber strands in cascade, it was possible to set up systems with lengths variable from one to seventeen kilometers. An ingenious splicing device, patented by Cselt, the Springroove® joint7, consented to join all the fiber strands in a short time. As shown in Fig. 4, the two fiber ends to be joined were manually made sliding in a groove obtained by means of two adjacent (accurately polished) steel cylinders. A superimposed frame, featuring two protruding springs, would keep in place the two ends, which were then glued with a drop of a special glue featuring about the same refracting index as the fiber core. The size of the Springroove® joint was only 1,5 by 0,5 centimeters and the splicing could be quickly executed, with naked eye, by an ordinary worker after a brief training. Differently from other competitive devices, it did not require micromanipulators or microscopes, or local or remote check, though featuring an average loss of only 0,05 dB. Fig. 4. 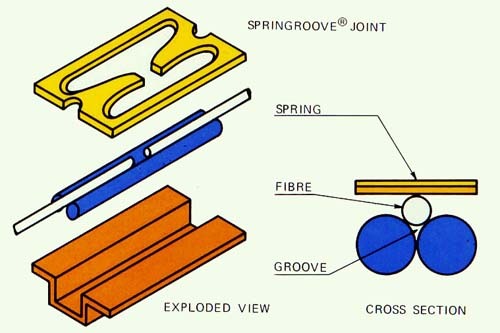 Exploded view of the Springroove® joint. The responsibility for the whole COS 2 project was of Cselt Laboratories, who also developed the electronic, and optoelectronic equipment, as well as innovative optical measuring devices 8. On the aforesaid route Cselt successfully tested a number of digital transmission systems, which were amply illustrated at the early ECOC and IOOC9 Conferences. More precisely (Fig. 5), a first 34 Mbit/s system over 10 km was reported at the 2nd ECOC in Paris (September 1976)10; a 140 Mbit/s system over 9 km span was reported at the 1st IOOC in Tokyo (July 1977)11; a 560 Mbit/s system over 6 km span was reported at the 4th ECOC in Genoa (September 1978)12. Cselt was also active in participating to the organization and in establishing the rules of the early ECOC and IOOC Conferences. As can be seen from the vast bibliography included in the following, the COS 2 experiment met with a stunning echo in the Press, both technical and non-technical, in addition to appreciation for our research bestowed to us at international conferences. With my surprise, I was appointed General Manager of Cselt in December of 1976, as a recognition of the leading role sustained in that research. This notwithstanding, I mostly acted, thereafter, as an orchestra conductor rather than a general manager, since I continued to exercise my technical competence and my international vision to foster research and make it known internationally. Fig. 5. Early achievements in fiber optic communication systems. Fig. 5 shows how many organizations were active to achieve higher and higher bit-rate and span values in the early years of optical fiber communications. As can be seen, Cselt Laboratories were often heading the way. It must be stressed that the above results could not be achieved without the aforementioned accurate and extended system study. In fact, the renowned paper by Kao and Hockham, being mostly concerned with the transmission medium (more specifically, with monomode step-index fibers), was crucial to fiber manufacturing but was insufficient for system design. 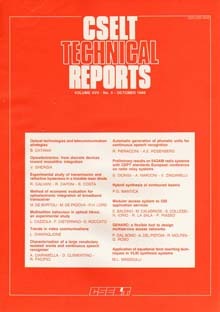 What we needed was to evaluate the repeater spacing vs. bit-rate in relation to the available fiber types (multimode step-index or graded index fibers) and to the available optoelectronic devices (LEDs, S-LEDs, lasers, p-i-n or avalanche photodetectors, of various materials and structures), for a given bit-error-rate (say 10—9). This study was performed very early in time to permit Cselt to successfully develop the various systems described above. We also filmed all the phases from fiber manufacturing at both Corning and Cselt, to cable manufacturing at Pirelli, laying and splicing in Turin by Sirti, and final system set up and testing by Cselt. This TV-documentary was awarded the “Silver Antenna” prize at the 3rd International Film Festival on Telecommunications and Electronics, Telecom ‘79, Geneva, 20-26 September 1979 13. 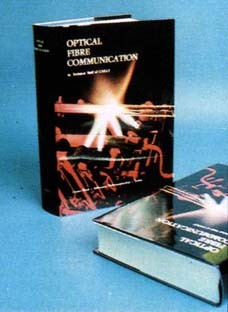 In addition to papers published in the main technical magazines or presented at the main specialized Conferences around the world, Cselt researchers issued the first complete handbook on Optical Communication (6000 copies of which were sold in the United States)14 and a monthly technical magazine, Cselt Technical Reports, both in English (Fig. 6). Many favorable reviews were issued for our book. Cselt researchers were also awarded a number of prizes. I personally received the IEEE Fellowship of the Institute of Electrical and Electronics Engineers, the Marconi Prize of the Italian Electrical Association (AEI) and the First Eurotelecom Prize by the European Union, delivered to me by H. M. the King of Spain, Juan Carlos 1º. This latter prize was bestowed in recognition of the leading role of Cselt in setting up the specifications and in participating to the execution and evaluation of the RACE (Research on Advanced Communications in Europe) project of the European Union, aimed to establishing the so-called Integrated Broadband Communication (IBC), largely based on optical fibers, through the harmonization of the various national projects (Fig. 7). Also noteworthy was the invitation of the London’s Royal Society to present the results of the above investigation 15. Fig. 7. 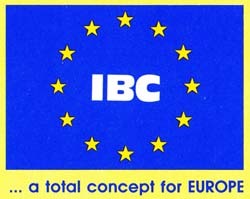 Two logos and mottos of the "Integrated Broadband Communication" (IBC) project of the European Union. Vittorio Ghergia and his co-workers had successfully produced advanced semiconductor lasers and integrated optics devices, in line with the international state of the art of the time. Renato Dogliotti, Angelo Luvison and Giancarlo Pirani had applied the modern statistical coding methods and communication theory to optical fiber systems, that were amply recognized internationally. I myself was investigating on the conditions for repeaterless transoceanic fiber links17 and the ultimate limits for optical fiber transmission18. Times changed, however, and the main Associate Company sponsoring our research lost interest and motivations in funding advanced research. It was objected that we had gone too far and that those achievements were not of instant interest to the company. An analysis of the reasons for this undoubtedly painful change is reported in one of my last papers, invited at the IOOC '89, Kobe (Japan) just before my retirement19. On the other hand, research is like an endless mountain, where we climb, we pause, and climb again, each time discovering wider and unexpected horizons, which, if, on one hand, deprive us of the joy of having reached the end, on the other hand they reward us with the joy of feeling each time nearer to the Creator of all that we are allowed to comprehend. But, of course, there are people who prefer the seaside. . . .
1 Kao, K. C.; Hockham, G.A., Dielectric-fiber surface waveguides for optical frequencies, Proc. IEE, Vol. 133, No. 7, July 1966, pp. 1151-1158. 2 Kapron, F. R.; Keck, D.B. ; Maurer, R.D., Radiation losses in glass optical waveguides, Conference on “Trunk telecommunications by guided waves”, 29 Sept.-2 Oct. 1970, London, published in Appl. Phys. Lett., vol. 17, Nov. 1970, pp. 423-425. 3 G. Tamburelli, Collegamenti telefonici via laser, Elettronica, No. 4, 1966; G. Tamburelli, Collegamenti sperimentali telefonici via laser, Elettronica, No. 3, 1968. 4 Catania, B., Sacchi, L., Progetto di collegamenti numerici in fibra ottica, XXIII Convegno Internazionale delle Comunicazioni, IIC, Genoa, October 9-11, 1975, p. 363-379 of Conference Proceedings. Also printed in “Cselt Rapporti Tecnici, No. 1, March 1976, p. 33-39. 5 Catania, B., Michetti, L,; Tosco, F., Occhini, E. and Silvestri, L,: First Italian experiment with buried optical cable, 2nd ECOC (European Conference on Optical Communication), Paris, September 27-30, 1976, p. 315-322 of Proceedings. 6 Buzzelli, S., Catania, B., Gagliardi, D., Tosco, F., Optical Fibre Field Experiments in Italy: COS1, COS2, and COS3/FOSTER, Invited paper, International Conference on Communicatiom – ICC ’80, Seattle, WA, June 1980, Conference Records, Vol. 3, p. 38.9.1-5. CH 1506-5/80/0000-0182$00.75 ©1980 IEEE. Also printed in "Cselt Rapporti tecnici" Vol. VIII - No. 3 - September 1980, p. 121-127. 7The Springroove® joint was invented by Giuseppe Cocito of Cselt and patented in Italy as: Cocito, G., Dispositivo per la giunzione di fibre ottiche, Italian Patent No. 1082810, of 10 May 1977. The Springroove® trademark was filed on 24 January 1978. Both were extended to eighteen countries of the world. The US patent "Device for splicing optical fibers and cables" was filed on 5 May 1978 and granted on 23 June 1981 as US Patent No. 4,274,708. 8 A backscattering measuring instrument, patented by Bruno Costa and Bruno Sordo of Cselt, was subsequently produced and sold worldwide by Anritsu. 9 The IOOC (Integrated Optics and Optical Communications) Conference, after its 30th venue in Yokohama (Japan), in 2007, has merged with OECC (Opto-Electronics and Communications Conference). 10 Fausone, A., Rosso, G., Veglio, G., Repeater for 34 Mbit/s transmission system over optical fibre, 2nd ECOC, Paris, September 27-30, 1976, p. 351-356 of Proceedings. 11 Catania, B., Recent Advances in Optical Fibre Research at Cselt, International Conference on Integrated Optics and Optical Fiber Communication (IOOC), Tokyo, July 18-20, 1977. 12 Fausone, A., Sacchi, L., First 560 Mbit/s trials on COS 2 optical cable, 4th ECOC, Genoa, September 12-15, 1978, p. 564-573 of Proceedings. 13 Communicating with light (“Comunicare con la luce”), TV Documentary by Cselt, awarded the “Silver Antenna” prize at the 3rd International Film Festival on Telecommunications and Electronics, Telecom ‘79, Geneva (CH), September 20-26, 1979. 14 Technical Staff of Cselt, Optical Fibre Communication, McGraw Hill Book Co., New York, NY, 1981. 15 Catania, B., Optical Technology and Network Requirements, Lecture at The Royal Society, London, June 29, 1988, Phil. Trans. R. Soc. Lond., A329, 9-21 (1989) p. 9-21. 16 Barbiani, A., De Bortoli, M., Moncalvo, A., Oddone, M., Sistema TAT-8, il primo collegamento sottomarino transatlantico in fibra ottica ("TAT-8, the first underwater transatlantic link with optical fibers), Elettronica e Telecomunicazioni, Year XXXIII, No. 4, 1984, p. 162-168. 17Catania, B., Towards Transoceanic Repeaterless Optical Links, invited paper, 5th National Symposium onOptical Fibres and their Applications, Polish Academy of Sciences, Warsaw (PL), 21-23 February 1989. Published on SPIE Vol. 1085, 1990 p. 1-12. 18 Catania, B., Limiti fisici alla trasmissione con fibre ottiche, Lecture at “1° Convegno Nazionale sulle Tecniche Fotoniche per l'Informazione” (FOTONICA `89), jointly organized by AEI and CNR, Santa Margherita Ligure (GE), 14-16 March 1989. Printed in Alta Frequenza, Rivista di Elettronica, vol. 1, no. 2, 1989, April-June 1989, p. 71-79. 19 Catania, B.,Optical Technologies and Telecommunication Strategy, Invited Paper. Seventh International Conference on Integrated Optical Fiber Communication (IOOC ‘89). Kobe (J), 18-21 July 1989. Printed in CSELT Technical Reports, Vol. XVII No. 5, October 1989, p. 325-328. Catania, B., Occhini, E., Paladin, G., Telecomunicazioni in fibra ottica, situazione attuale e prospettive, XXI Congresso Scientifico Internazionale per l’Elettronica, Rome, March 1974. Catania, B., Considerazioni generali sui mezzi e sulle modalità di trasmissione, Lecture at Cselt Auditorium on the occasion of the 10th Anniversary of Cselt Foundation, Turin, 21 January 1975. Catania, B., Applicazione delle fibre ottiche ai sistemi di trasmissione, Tavola Rotonda Sistemi di trasmissione utilizzanti onde elettromagnetiche guidate e in propagazione libera. LXXVI Riunione Annuale AEI. Bari, 28 September - 4 October 1975. Catania, B., Sacchi, L., Progetto di collegamenti numerici in fibra ottica, XXIII Convegno InternazionaIe delle Comunicazioni; Awarded as the “contribution of the highest scientific level,” Genoa, 9-11 Ocober 1975. Catania, B., Di Lullo, A., Longoni, S., Sacchi, L., Applicazioni delle fibre ottiche ai collegamenti a breve distanza, XXIII Congresso Scientifico Internazionale per l’Elettronica, Rome, 22-24 March 1976. Catania, B., Valutazione della maggiorazione di potenza ottica, richiesta all'ingresso di un fotoricevitore per fibre ottiche, per effetto della dispersione della fibra, Cselt Internal Reports, no. 76.02.030, 10 May 1976. Catania, B., Comunicazioni su fibra ottica, Lecture at Cselt Auditorium, 2nd Meeting with Associate Companies. Turin, 22 June 1976. Catania, B., Evolution of Communication Systems from Microwave to Optical Frequencies, 6th European Microwave Conference, Rome, 14-17 September 1976. Catania, B., Colavito, C., Pellegrini, G., Reliability and Cost Evaluation in View of the Introduction of Optical Fibres in Communication Networks, 2nd European Conference on Optical Communication (ECOC) , Paris, 27-30 September 1976. Catania, B., Michetti, L., Tosco F., Occhini, E., Si1vestri, L., First Italian Experiment with Buried Optical Cable, 2nd ECOC. Paris, 27-30 September 1976. Catania, B., Recent Advances in Optical Fibre Research at Cselt, 1st International Conference on Integrated Optics and Optical Fiber Communication (IOOC), Tokyo (J), 18-20 July 1977. Catania, B., Bigi, F., Colavito, C., Optical Fibres in Local Digital Networks, 3rd ECOC, Munich (D), 14-16 September 1977. Catania, B., C0S2: Il primo sistema sperimentale di trasmissione in fibra ottica a Torino, Rotary International of East Turin, North Turin, Northwest Turin, and Chivasso, Turin, 26 January 1978. Catania, B., Sistemi di comunicazione in fibra ottica, Seminary at Centro Studi Propagazione e Antenne (CNR), Istituto Elettronica e Telecomunicazioni, Polytecnic of Turin. 26-27 January 1978. Catania, B., Comunicare con la luce, Joint Meeting of A.E.I., A.N.I.P.L.A., l.E.E.E. North Italy Section. Regione Piemonte. Turin, 8 June 1978. Catania, B., Dati generali sulla ricerca Cselt, Lecture at Cselt Auditorium, 3rd Meeting with Associate Companies,Torin, 3-4 July 1978. Catania, B., Optical Fibre Communication through Time and Space, Keynote Address. 4th ECOC, Genoa, 12-15 September 1978. Catania, B., Attuale interesse dell'industria italiana per la ricerca di elettromagnetismo, Round Table, 2nd National Meeting of Applied Electromagnetism, Pavia, 2-4 October 1978. Catania, B., Risultati della IV conferenza europea sulle comunicazioni ottiche, XXVI Convegno Internazionale delle Comunicazioni, Genoa, 5-7 October 1978. Catania, B., Lo Cselt e la sua attività nel campo delle telecomunicazioni, A.E.I. Sez. Milano, l.E.E.E. North Italy Section. Milan, 22 March 1979. Catania, B., Fibre ottiche: dalla ricerca alle applicazioni, Headquarters of Carabinieri's Legion, Turin, 6 December 1979. Catania, B., Fibre ottiche: dalla ricerca alle applicazioni, A. E. I. Sez. Milano, I. E. E. E. North Italy Section, 23 January 1980. Catania, B., Fibre ottiche: dalla ricerca alle applicazioni, A. E. I. Sez. Roma, A. I. I. T. and Gruppo TLC, A. E. I. Roma, 16 April 1980. Catania, B., “Le attività di ricerca dello Cselt nel campo delle telecomunicazioni”. Cselt, Incontro con esponenti Università e mondo scientifico nazionale. Torino, 23 aprile 1980. Catania, B., Buzzelli, S., Gagliardi, D., Tosco, F., Optical Fibre Field Experiments in Ita1y, COS1, COS2 and COS3 FOSTER, (invited paper), International Conference on Communications (ICC), Seattle, WA, 8-12 June 1980. Catania, B., Fibre ottiche: dalla ricerca alle applicazioni, L’Elettrotecnica,vol. LXVII, no. 7, July l980, p. 655-665. Catania, B., Principali ricerche svolte dallo Cselt negli anni `79-80, Cselt Auditorium, 5th Meeting with Associate Companies, Turin, 29-31 October 1980. Catania, B., Notizie generali sullo Cselt, Cselt Auditorium, Meeting with Scientific Journalists, Turin, 13 November 1980. Catania, B., Prospettive e sviluppo delle comunicazioni in fibra ottica, Seminario Semiconduttori III-V e loro applicazioni, Istituto MASPEC (CNR), Settore Semiconduttori del G.N.S.M.;. Parma, 4-5 December 1980. Catania, B., Fibre ottiche: dalla ricerca alle applicazioni. U.S. International Marketing Center, Elettronica U.S.A. '81. Milan, 30 March - 3 April 1981. Catania, B., La situazione della ricerca sulle tecnologie della telematica, Fiera di Milano, International Meeting “Telematica '81”. Milan, 15-16 April 1981. Catania, B., Bonaventura, G., Gagliardi, D., Paladin, G., Tosco F., COS 3/FOSTER, First Optical Fiber System for Operational Service in Italy, International Conference on Communications (ICC), Denver (CO), 14-18 June 1981. Catania, B., Telecommunications through Optical Fibres, Congress and Twelfth Assembly of the International Commission for Optics (ICO-12). Graz (A), 31 August - 5 September 1981. Catania, B., General Criteria for Collaboration in the Framework of COST, COST Technical Committee, Telecommunications, Seminary on “Future Changes and Progress in the Field of Teiecommunications,” Rome, 8-9 October 1981. Catania, B., Resoconto annuale e prospettive, Cselt Auditorium, 6th Meeting with Associate Companies, Turin, 13-15 October 1981. Catania, B., Telecommunications through Optical Fibres, 4th International Conference on Lasers and their Applications. Leipzig (D), 19-23 October 1981. Catania, B., La situazione della ricerca sulle tecnologie della Telematica, L’Elettrotecnica, vol. LXVIII, no. 10, October 1981, p. 855-861. Catania, B., Applicazioni attuali e prospettive future. Round Table on "Fibre ottiche - Stato attuale e prospettive di sviluppo," A.E.I. Sez. Milano, A.I.R.I., Centro Previsioni Tecnoiogiche. Giornata di studio, Milano, 9 February 1982. Catania, B., 100 Km senza ripetizione con la nuova fibra ottica Cselt. Cselt Auditorium, Meeting with Press. Milan, 30 April 1982. Catania, B., La nuova fibra ottica Cselt, L’Elettrotecnica, vol. LXIX, September 1982, p. 863-866. Catania, B., Resoconto annuale e prospettive, Cselt Auditorium, 7th Meeting with Associate Companies. Turin, 26-28 October 1982. Catania, B., Fibre ottiche: dalla ricerca alle applicazioni. A.E.I. Sez. Lucana. Potenza, 6 December 1982. Catania, B., Prospettive di sviluppo delle telecomunicazioni, "Giornate delle Telecomunicazioni." Fondazione Agnelli, Turin, 7 April 1983. Catania, B., Reti e servizi a larga banda—Situazione internazionale, Cselt Auditorium, Giornata di studio “Reti e servizi a larga banda,” Turin, 22 April 1983. Catania, B., Il futuro delle telecomunicazioni. University of Catania. Catania, 28 April 1983. Catania, B., La ricerca tecnologica nel settore delle telecomunicazioni, Meeting “Società e tecnologia: le frontiere degli anni '90,” Centro Promozione e Valorizzazione Ricerca (CEVAR), Perugia, 6-8 May 1983. Catania, B., European Experiments for Broadband Integrated Service Networks, invited paper, 4th International Conference on Integrated Optics and Optical Fiber Communication (IOOC), Tokyo (J), 27-30 June 1983. Catania, B., Nuove frontiere nelle comunicazioni in fibra ottica, American Consulate, Meeting and Exhibition on Optical Fibers, Milan, 3-4 November 1983. Catania, B., Prospettive di sviluppo delle telecomunicazioni, Headquarters of 4th Alpine Corps, Bolzano, 17 February 1984. Catania, B., Prospettive di sviluppo delle telecomunicazioni, International Meeting “L'immagine elettronica,” Bologna City Hall, 25-29 February 1984. Catania, B., Resoconto annuale e prospettive, Lecture at Cselt Auditorium, 8th Meeting with Associate Companies, Turin, 6-8 March 1984. Catania, B., Lo sviluppo tecnologico delle telecomunicazioni. Situazione attuale e prospettive, Defense Unit Group, Rome, 16 March 1984. Catania, B., Prospettive di sviluppo delle telecomunicazioni, Meeting “Proposte culturali `84”, Comune di Rovereto Trentino, 6 April 1984. Catania, B., Prospettive di sviluppo delle reti e servizi a larga banda, Milan Fair, Meeting "Telematica ‘84—Reti a fibre ottiche per nuovi servizi di telematica: la città cablata,” Milan, 16 April 1984. Catania, B., Prospettive di sviluppo delle telecomunicazioni, Elettronica e Telecomunicazioni, vol. XXXIII, no. 2, March-April 1984, p. 81-90. Catania, B., Moderne tecnologie televisive nelle reti a larga banda, International Meeting “Critica 1984: Il videogioco della comunicazione”. Montecatini's City Hall, 17-20 May 1984. Catania, B., La città cablata e i nuovi servizi, Media Duemila, vol. II, No. 6, June 1984. Catania, B., The Changing Technological Base in Telecommunications, Invited Lecture, European Industrial Research Management Association (EIRMA), Special Conference “Towards a New Technological Base for Industry in the 1990,” Paris, 17-19 October 1984. Catania, B., Prospettive dei laser nelle telecomunicazioni, 1st International Congress on the Applications of Laser in Medicine, Surgery and Veterinary Medicine, Turin, 9-10 November 1984. 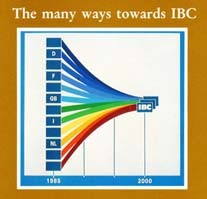 Catania, B., Integrated Broadband Communication (IBC), a Total Concept for Europe, IEEE Global Telecommunications Conference (GLOBECOM), Atlanta (GA), 26-29 November 1984. Also printed as Cselt Monograph, November 1984. Catania, B., Scenari di ricerca, Lecture at Cselt Auditorium, on the occasion of the 20th Anniversary of the Foundation of Cselt, Special Meeting on “Prospettive di sviluppo delle telecomunicazioni,” Turin, 5 December 1984. Catania, B., L'innovazione nel settore delle comunicazioni, Società Italiana Organizzazione Internazionale (SIOI), Special Meeting on “Il futuro dell'innovazione tecnologica in Italia e nella CEE”, Turin, 28 March 1985. Catania, B., Resoconto annuale e prospettive, Cselt Auditorium, 9th Meeting with Associate Companies, Turin, 8-10 May 1985. Catania, B., Servizi per l'utenza residenziale nelle future città cablate, Superior Institute of Posts and Telecommunications (I.S.P.T. ), Symposium on “I fattori umani nei nuovi servizi telematici e di telecomunicazione”, Rome, 21-22 May 1985. Catania, B., Les projets européens en vidéocommunication, CNET, Journées Techniques “Réseaux et services de vidéocommunication”. Montpellier, 26-27 June 1985. Catania, B., Incontro con Giornalisti corrispondenti da Torino di quotidiani e periodici nazionali. Cselt Auditorium, 10 September 1985. Catania, B., L'innovazione nella comunicazione, Cselt Monograph, April 1985. Catania, B., La thérapie de la communication pour l'Europe, Mouvement Europeen, Forum “L'Europe et les nouvelles industries de communication”, Paris, 28 September 1985. Catania, B., L'importanza economica della fibra ottica nella rete pubblica di telecomunicazioni, CONFAPI, International Conference “Verso gli anni 90. L'impresa minore e la politica industriale in Occidente”, Round Table “Nuovo rapporto della Scienza con l'Industria,” Turin, 4-5 October 1985. Catania, B., Impatto delle tecnologie fisiche sulle scelte di sistema, Cselt Auditorium, Special Meeting “Ruolo delle tecnologie fisiche nelle telecomunicazioni,” Turin, 29 October 1985. Catania, B., Redesigning the Home-System for the Information Age. 7èmes Journées Int. IDATE “L’Europe des communications,” Montpellier, 20-22 November 1985. Catania, B., Presente e futuro delle telecomunicazioni, Rotary Club of Catania, 21 Jamuary 1986. Catania, B., Gagliardi, D., Sacchi, L., Research and Experiments on Broadband Subscriber Networks in Italy, invited paper, Joint Conference, XXXIII Int’l Congress on Electronics, XXVI Int’l Meeting on Space, Rome, 18-20 March 1986. Catania, B., L’Europe des réseaux multiservice a large bande, invited paper, 6èmes Journées Européennes de l’Optoélectronique (OPTO), Paris, 13-15 May 1986. Catania, B., The Economics of Optical Cable Networks, invited paper, CABLE EUROPE '86, European Communications Week. Amsterdam, NL, 22-23 May 1986. Catania, B., Resoconto annuale e prospettive, Cselt Auditorium, 10th Meeting with Associate Companies, Turin, 4-6 June 1986. Catania, B., Telecomunicazioni in Europa: situazione e prospettive, Lecture at IBM Italia, Segrate, 28 August 1986. Catania, B., The many ways towards IBC, Invited Lecture, 4th RACE Seminar of the European Union, Brussels, 14 October 1986. Also printed in Chinese by the European Community, on the occasion of “Telecomp China 87” Brochure: "Integrated Broadband Communication in Europe—The RACE approach" (authored by Commission of European Communities). Also printed as Cselt Monograph, November 1986. Catania, B., Future Telecommunications Technology, invitated paper, European Academic Research Network (EARN), Berlin, 27-29 October 1986. Catania, B., Towards Broadband ISDN, invited paper, 1st Pan European Conference on ISDN, ISDN Europe '86, IGI Europe, Div. of Information Gatekeepers, Basel (CH), 5-7 November 1986. Catania, B., Views of Administrations, Keynote Address, 3rd International Conference on “New Systems and Services in Telecommunication”. Liège (B), 12-14 November 1986. Catania, B., Il punto di vista delle imprese: Cselt, Meeting at Fondazione Agnelli on “I rapporti Università-Industria per la ricerca: problemi amministrativi e gestionali,” Rome, 26 November 1986. Catania, B., La via dell'Europa verso le comunicazioni del futuro, Lecture at SIP, Direzione Regionale Piemonte e Valle d'Aosta, Turin, 2 March 1987. Also printed as Cselt Monograph, November 1986. Catania, B., The Third Challenge of Optical Communication, Keynote Address, 11th Australian Conference on Optical Fibre Technology, Institution Radio and Electronics Engineers of Australia, Geelong, Victoria, 1-4 December 1986. Published in “Monitor” on January-February 1987. Catania, B., The Many Ways towards IBC, International Electrotechnical Commission (IEC), Meeting of Committee 86B (Optical Fibers), Turin, Cselt Auditorium, 5 March 1987. Catania, B., La via dell'Europa verso le telecomunicazioni del futuro, University of Salerno, 3 April 1987. Catania, B., The Third Challenge of Optical Communication, Lecture at the Telecommunications Research Centre, New Delhi, 29 April 1987. Catania, B., Il laser nelle telecomunicazioni, Lecture at the International Medical Symposium SANITEC '87, Turin, 5-16 May 1987. Catania, B., Microelectronic Technologies in Industry, Lecture at "Symposium on New Semiconductor Technologies, Devices and Materials for Electronics," The Italian Institute, London, 22 May 1987. Catania, B., Rendiconto annuale e prospettive, Cselt Auditorium, 11th Meeting with the Associate Companies, Turin, 26-28 May 1987. Catania, B., Comunicazioni ottiche, Lecture at Fondazione G. Marconi on the occasion of the 50th Anniversary of Marconi's death, Ministero Beni Culturali e Ambientali, Ministero Poste e Telecomunicazioni, Pontecchio Marconi (BO), 20 July 1987. Published on L’Elettrotecnica, Vol. XXVII, No. 6, June 1990, p. 505-513. Catania, B., The European Way towards Broadband ISDN, Keynote Address, 13th European Conference on Optical Communication, Helsinki, 13-17 September 1987, published in Cselt Technical Reports, Vo1. XV, No. 7, December 1987, p. 459-465. Catania, B., Nuovi aspetti del sistema casa, Lecture at “Domotronica: la casa del futuro”, AEI Gruppo Impianti Elettrici Utilizzatori, Sez. Milano, Milan, 28-29 October 1987. Catania, B., Le punte della ricerca IRI: fibre ottiche, Lecture at “La ricerca e le frontiere tecnologiche del Gruppo IRI”. Genoa, 19-20 November 1987. Catania, B., Nuove tecnologie e scelte di sistema nelle telecomunicazioni, SIP, Convegno Internazionale Ruolo dei gestori pubblici nell’evo1uzione tecnologica e di mercato delle telecomunicazioni, Dicastero Comunicazioni e Trasporti Repubblica S. Marino, San Marino (RSM), 3-4 December 1987. Published in Poste & Telecomunicazioni, May-June 1988. Catania, B., Nuovi materiali trasparenti per le fibre ottiche del futuro, invited paper, 88th Annual Meeting of Italian Electrotechnical Association (AEI), Catania, 27-30 September 1987. Printed in L’Elettrotecnica, no. 1, vo1. LXXV, January 1988, p. 13-18. Catania, B., Lo Cselt nel contesto italiano della ricerca nelle telecomunicazioni, Keynote Address at “Ricerca nel settore delle telecomunicazioni in Italia”. Gruppo Nazionale Telecomunicazioni e Teoria dell'Informazione del CNR. Venice, 13-15 April 1988. Catania, B., Eurotelecommunications: dream or reality?, invited paper, Information Gatekeepers Inc., ISDN/88, St. Louis, Missouri, 18-21 April 1988. Catania, B., Perucca, G., The supplier impact, Cselt Internal Reports, R.D. 88.349, 1 September 1988. Catania, B., Comunicare con la luce, Invited Lecture at Rotary Club of Ciriè (TO). 3 May 1988. Catania, B., Il mondo delle telecomunicazioni, Meeting "Il Gruppo IRI incontra il Politecnico”, Turin, 11 May 1988. Catania, B., Optical Technology and Network Requirements, invited paper, Seminary on Optical Technology and Wideband Local Networks, Royal Society, London, 29-30 June 1988. Published on Phil. Trans. R. Soc. Lond., A329, 9-21 (1989) p. 9-21. Catania, B., L'impatto delle nuove tecnologie nelle telecomunicazioni, Meeting “Telecomunicazioni e sviluppo tecnologico - L'appuntamento europeo nel 1992” , Fiera del Levante, Bari, 17 September 1988. Catania, B., Towards an effective information infrastructure, Lecture at ONLlNE '89, 12th European Congress Fair for Technical Communications, Berlin, 30 January-3 February 1989. Catania, B., The European RACE Program, Invited paper , Conference on Optical Fiber Communication (OFC) '89, Plenary Session on “Subscriber Loop Trials in Europe” and “Fiber-to-the-Home” Evening Forum, Houston, Texas, 6-9 February 1989. Catania, B., La ricerca tecnologica di base nell'area torinese, Round Table at the Unione Culturale Franco Antonicelli, on “La rivoluzione delle telecomunicazioni. Fare ricerca a Torino”. Turin, 28 February 1989. Catania, B., Limiti fisici alla trasmissione con fibre ottiche, Lecture at “1° Convegno Nazionale sulle Tecniche Fotoniche per l'Informazione” (FOTONICA `89), jointly organized by AEI and CNR, Santa Margherita Ligure, 14-16 March 1989. Printed in Alta Frequenza, Rivista di Elettronica, vol. 1, no. 2, 1989, April-June 1989, p. 71-79. Catania, B., Optical Technologies and Telecommunication Strategy, invited paper, 7th International Conference on Integrated Optical Fiber Communication (IOOC ‘89), Kobe (J), 18-21 July 1989. Reprinted in Cselt Technical Reports, Vol. XVII, No. 5, October 1989, p. 325-328. Printed in CSELT Technical Reports, Vol. XVII No. 5, October 1989, p. 325-328. Catania, B., Towards Transoceanic Repeaterless Optical Links, invited paper, 5th National Symposium Optical Fibres and their Applications, Polish Academy of Sciences, Warsaw (PL), 21-23 February 1989. Published on SPIE Vol. 1085, 1990 p. 1-12. Catania, B., Meeting on "Optical Fibers in Italy" with Hon. F.M. Pandolfi and Prof. P. Fasella, AREL. Milan, 31 March 1989. Catania, B., The Way Towards Paneuropean Communication, Keynote Address, Italian Embassy in London and Italian Institute of Edinburgh, Meeting “Communication: the future” in the frame of “International Festival of Science and Technology” (Atti ?). Edimburgo, 3—12 April 1989. Catania, B., La videocomunicazione nella casa del futuro, Seminar lRI “Situazione attuale e prospettive future della videocomunicazione”, Rome, 12 April 1989. Catania, B., Eurotelecommunications: dream or reality, Invited Lecture, Seminar at the Royal Swedish Academy of Engineering Science, Stockholm (S), 20 April 1989. Catania, B., Verso collegamenti transoceanici in fibra ottica senza ripetitori, Fondazione Guglielmo Marconi, Convegno “Telecomunicazioni intercontinentali”, San Marino (RSM), 26 April 1989. Catania, B., The way towards paneuropean communication, Ministerio de Transportes, Turismo Y Comunicaciones, “Dia Mundial de las Telecomunicaciones”, Almeria (E), 17 May 1989. Catania, B., Incontro CNR-Politecnico. Turin, 22 May 1989. Catania, B., Oral report of the Chairman of the P&P Committee to the EIRMA Annual General Meeting, Brussels, 2 June 1989. Catania, B., Resoconto annuale e prospettive, Cselt Auditorium, 12th Meeting with Associate Companies, Turin, 27 June 1989. Catania, B., Information Technologies and Telecommunications, “Workshop Technology ‘99." European Industrial Research Management Association (EIRMA), Paris, 11-13 October 1989. Catania, B., Worldwide Evolution of Broadband Communications with Special Attention to ATM technology, "ATM Forum," Berlin, 20 October 1989. Catania, B., Dall’Elettronica alla Fotonica e dalla Fotonica alla Bionica, Lecture at Associazione Elettrotecnica ed Elettronica Italiana (AEI), Milan, 8 March 1990. Published on L’Elettrotecnica, Vol. LXXVII No. 7, p. 27-43, July 1990. 2. Comunicaciones Ópticas, por J. V. Atin Balbas (CIE-CTNE), Revista de Telecomunicación, Giugno 1977, p. 19 seq. o Telecommunications Journal, IV, 1981 “After a dozen books published to date on optical fibre communication and related subjects, this volume is one of the firsts which attempts an in-depth coverage of both the fundamental (i.e. theoretical and technological) and the practical (i.e. design, measurement and implementation) aspects of the new transmission medium, the optical fibre, in telecommunications. 122. L’Intervista—È ancora sordo ma presto capirà, di Sergio Veneziani, Il Giorno, 23 maggio 1985. 124. Affermazione italiana nella ricerca sulle telecomunicazioni: lo C.S.E.L.T. di Torino, Intervista di Maretta Colombo a Basilio Catania, Personale e Lavoro, Rivista di Direzione, Organizzazione, Formazione, Personale, Lavoro, Corso Dante 124, 10126 Torino, A. XXI, N. 6, Giugno 1885, p. 2-6. 191. Dibattiti in un importante convegno a Milano. I maggiori problemi della TV del futuro—Guardando il video ad alta definizione, perplessi, di Carlo Solarino, Domani, ottobre 1986. 210. Italy: transition takes shape— Special Reports [Special Report on the evolution of telecommunications in Italy with special reference to companies of the STET Group. ], Communications Engineering International, July 28, 1987 (9 pages). 213. Scienza e tecnologia nuova collaborazione tra Torino e Trieste—Consulenze e stage incrociati tra lo Cselt e il centro di Abdus Salam, Italia Oggi, 1 febbraio 1988. 214. Una scienza per il Terzo Mondo—Il premio Nobel per la fisica 1979 Abdus Salam invita l’Italia a partecipare attivamente ai programmi di sviluppo. Ha tenuto una conferenza allo Cselt di Torino, Media Duemila, n. 2, Febbraio 1988.